Nancy M. West: COUNTDOWN TO NATIONAL FERAL CAT DAY! 21 DAYS LEFT! COUNTDOWN TO NATIONAL FERAL CAT DAY! 21 DAYS LEFT! The gang at Stone Ledge applauds Sugar Ray! ALBANY -- Just like his namesake, 10-week-old stray kitten Sugar Ray is a fighter. 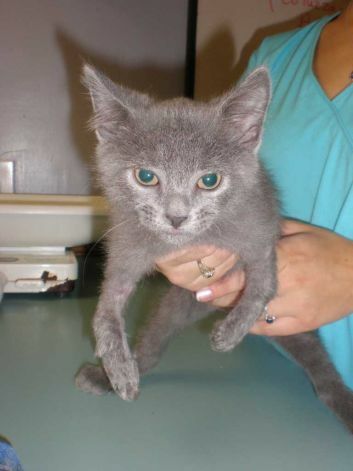 An affable kitty with a soft, solid-gray coat and striking eyes, Sugar Ray was born with deformed front legs on the streets of Albany. Discovered along with his three siblings and their mother last month by caretakers of a feral cat colony, the whole family was rescued. A friendly, affectionate and playful bunch, all are up for adoption through AnimaLovers, a nonprofit rescue organization that aids both domestic and feral cats throughout the Capital Region. "He's a mini-inspiration, always charming, always ready with a purr and always doing his best with what he's been given," said foster mom Ronnie Lyons, a senior trainer at SUNY Research Foundation. "Nothing fazes him, and he never ceases to amaze me or make me laugh." Even though his legs are in baby blue splints, Sugar Ray still manages to hold his own with the kittens he's being fostered with. When it's time to play, he leans back on his hind legs, swaying back and forth with his front paws in the air -- like a boxer. Sugar Ray is being treated by Just Cats veterinarian Sue Sikule, who is hopeful that with further treatment and re-splinting, his front legs can be straightened, at which point he'll be put up for adoption. AnimaLovers is holding a Kitten Adoption Clinic from 11 a.m. to 4 p.m. Saturday, at PetSmart in East Greenbush, where Sugar Ray will be the guest of honor. The rescue organization, like so many others, is overwhelmed with cats and kittens. "Everyone who meets them (Sugar Ray and family) loves them," Lyons said. "He's a pretty amazing little dude."